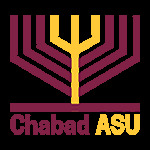 Chabad offers a variety of services to students at Arizona State University . We provide, social, religious, educational and spiritual programs, all in a tolerant, non judgemental setting. Click on any of the links to the left to see some of the many past events, classes and programs at Chabad. We're happy you enjoyed them... if you missed these exciting events, be sure to take part in our future events! Welcome Back ASJew Mega BBQ Party!